The Rubicon spring-over conversion kit moves the leaf spring perch to the top of the axle, increasing lift and flexibility. Spring-over axle lifts retain a stock-type ride quality by retaining the original leaf spring. 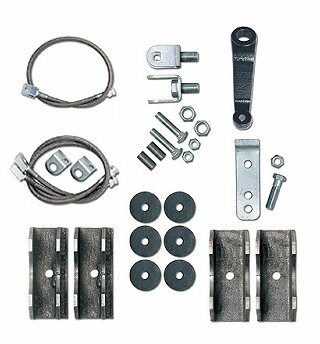 Installation of this kit encompasses removing the original spring perches, welding of new perches, and other adjustments. A CV-type driveshaft is strongly recommended for this application. Net lift from the conversion is minimum 5.5-inches. For greater durability, and a total of 7-inches of lift, we recommend running RE1445 & RE1444 Extreme-Duty leaf Springs.